With the average temperature falling in January, the number of frostbite patients usually peaks drastically in that month, but the number has been declining in recent years. 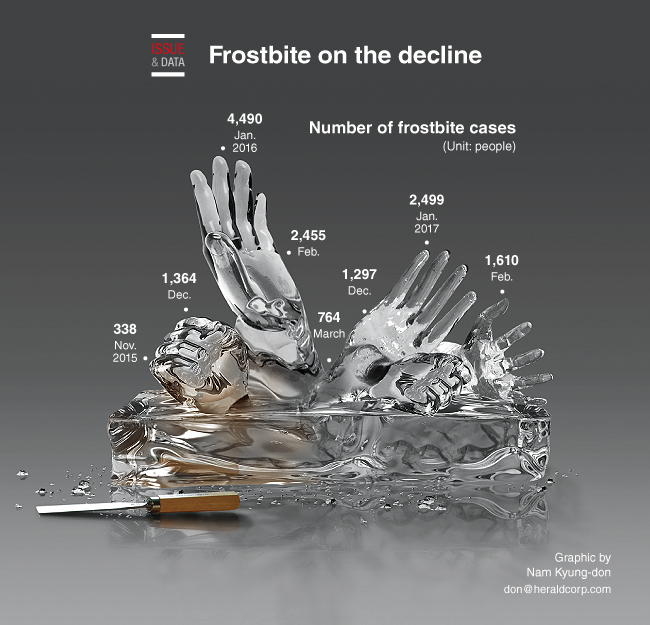 According to data from the Health Insurance Review & Assessment Service, the number of patients suffering from frostbite reached 17,496 in 2014, 11,122 in 2015 and 9,806 in 2016. There were 1,297 patients in December 2016, 2,499 in January 2017 and 1,610 in February 2017. The proportion of patients in their 50s was the highest at 18.5 percent in 2016, followed by those in their 40s (17.2 percent), 60s (16.7 percent) and 70s (12.6 percent).